In the course of researching this special report, Portland Press Herald/Maine Sunday Telegram reporters have assembled a broad and growing list of resources that may be useful to seniors and their caregivers. Shown below is a view of the "general information" category. Click on the name of a resource to display details and contact information. You can view other categories, and narrow down the list to display resources in your county, by using the menus at right. If you have other questions, ask an expert. Leave a comment below, or email your question to aging@pressherald.com. 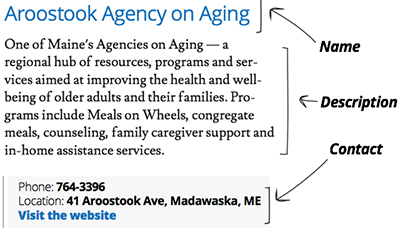 If you're just starting to consider the issues related to aging for yourself or a loved one, and aren't sure where to start, Maine's regional Agencies on Aging (listed here) are an excellent place to start. These agencies are well-connected to dozens of organizations, health professionals, and volunteer networks throughout the state, and they can provide tailored advice specific to your particular situation. One of Maine’s Agencies on Aging — a regional hub of resources, programs and services aimed at improving the health and well-being of older adults and their families. Information, advocacy and referral services for seniors and their families. Central and Midcoast Maine’s Agency on Aging — a regional hub of resources, programs and services aimed at improving the health and well-being of older adults and their families. Programs include Meals on Wheels, caregiver support, social programs and transportation services to medical appointments.